Who’s to say what makes a “good” or “bad” clown nowadays? I mean sure, it’s probably “good” if you can juggle and make balloon animals. And sure, it’s probably “bad” to wield oversized scissors as weapons, or you know, absolutely terrify the pants off of everyone around you. But, when the Freak Show rolls into town, you have to assume you never know what’s going to come from down the street, around the corner, or out of the bushes just out of sight. In any case, there can only be one entertainer in town, and that’s you! 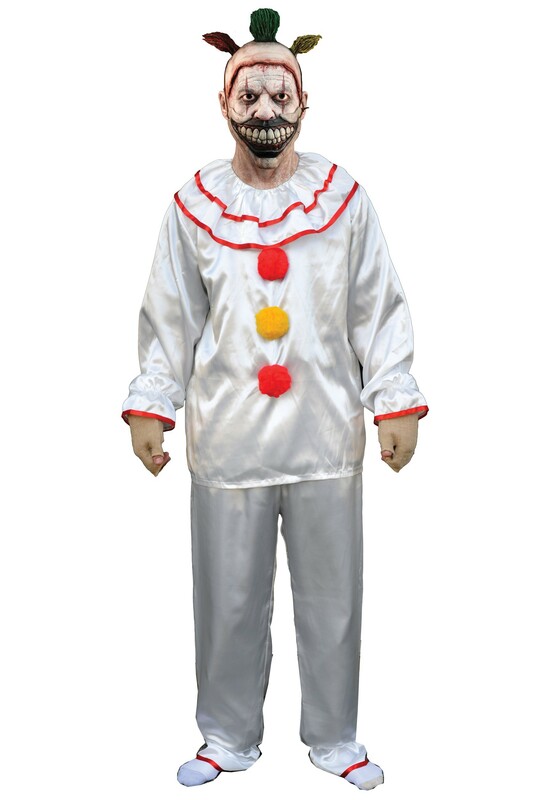 So if you want to make sure that no other acts are stealing your business, you can put on this American Horror Story Adult Twisty the Clown Costume and scare away the competition. We all know that at heart, clowns are not meant to entertain, but to haunt our nightmares. Really. When was the last time seeing a clown made anyone happy? In fact, even Marvin, our bravest lead accountant, was harassed by a bunch of guys wearing clown outfits a few months ago. So embrace your true purpose: terror. If you ask us, this Twisty the Clown costume masterfully puts it together. This officially licensed costume is guaranteed to frighten your friends, or whoever you have a vendetta against. The shirt encloses with a velcro tab and the elastic at the wrists, ankles, and waistband help for a comfortable fit. Don’t forget the burlap fingerless gloves for the perfect eerie weirdness, as you hold whatever creepy props you decide to carry around. Just remember, the mask is not included, so pick up that accessory and get on your way to terrifying the away the competition.